Barely three weeks ago, the Armenian community watched with pride, as Anthony Bourdain's program featuring Armenia aired. Sadly, today, we mourn his passing. 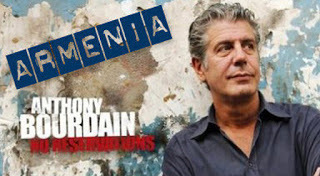 Thank you, Mr. Bourdain, for sharing your culinary expertise and recent tour of Armenia with the world. It was nice to see an episode featuring Armenia that touched on more than the obligatory visit to watch lavash being made and rugs woven. Very sad.